Time to learn about Russia! Start by making a KWL chart. In the K column, list the things you already KNOW about Russia. In the L column, record the things you WANT TO KNOW. And finally, as you go about completing this country exploration of Russia, write all the things you’ve LEARNED in the L column. 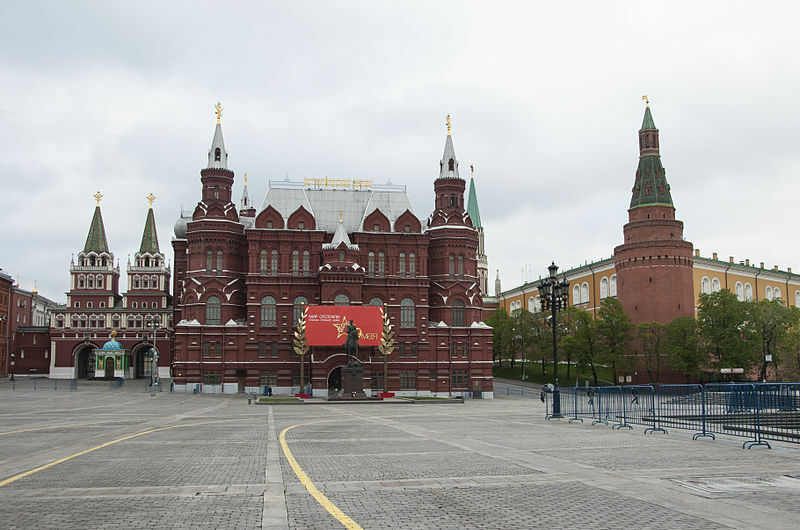 This is the Kremlin in Moscow. It is a walled fortress made up of many buildings inside the city limits and the seat of government for Russia. Red brick buildings and walls surround the perimeter of the fortress. Inside are yellow walled palaces and government buildings as well as white golden topped churches. Photo by Кривошеина Мария, CC license, Wikimedia. Russia is the largest country in the world. It’s full of rich history, beautiful architecture, and a varied landscape. Because of its sheer size, it has everything from polar lands to plains, and mountains to tundra. It has also had many problems as it implemented communism. Go to the library or look online for information about Russia and discover what it’s like there. Print out this Russia Fact Book for your kids. It has pages on natural resources, religion, cities, language, holidays, and a map. On the cover is a picture of the Russian flag to color. This Russia Fact Book is like a simplified lapbook – all the great information without all the cutting and pasting. For more cool geography explorations and printables, check out the Layers of Learning geography page. You’ll find general geography lessons; continent, country, and state explorations; and tons of printable maps and activities. Unit 3-10 has an entire study on the history of Russia with lots of learning activities you’ll enjoy. Map of area explored by David Thompson, Canadian cartographer, fur trader, and explorer. Thanks for putting together this fun book on facts about Russia! I must say, however, that several words are misspelled in Russian (cheese, yes, and please) and “hi” is actually pronounced in Russian as “privet”, not “previt”. Elena, we don’t speak Russian. We found the words and the phonetic pronunciations online, I believe (can’t really remember now). If you would be willing to help us out we’d be very grateful. Please email us at contact@www.layers-of-learning.com if you are willing.